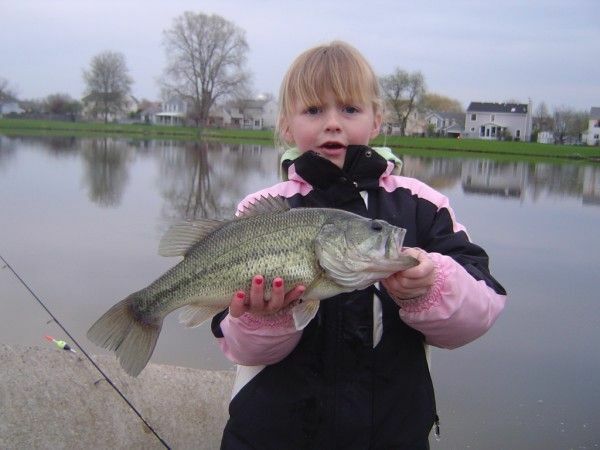 This is my favorite picture of my daughter after she landed a 4 lb. LMB on a small neighborhood retention pond using a slip bobber with a minnow and 4 lb. mono. She was seven at the time and squealed with delight. The first thing she said after she landed it was "Oh my gosh daddy it looks looks like a sea monster!" She also got an honorable mention with her picture shown on Bass Pro Shops "Next Generation" TV show. She got a t'shirt. ball cap, CD and a $25 gift card to BPS. Very Cool stuff. I was a very proud. Last edited by T-bo on 08:42pm - Jan 5,09, edited 2 times in total. THE BEST KID/FISHING pic seen in quite awhile! Just love her nails. BEAUTY fish as well. I am not sure if she really knows what she's got. She seesm timid of that Bass! TAKE IT DAD! That's what my girls used to say. Too cute. My kids ask me why I take so many photos and I tell them because when I get old and loose my mind you guys will still be able to remember these things for me. Great picture. Yeah I think she was a little nervous when she was holding it. Her expression kinda says "woahh!" LOL!! Thats awesome:) Good job little one! You posted a report with that picture didn't you T-bo? I remember that shot, it's great! Yeah I did Marc but I loved it so much I had to post it again. To me that was the best trophy I could have ever had. I was very proud of her. As far as the BP gift card, not a chance she made me take her there so she could shop for guess what..... clothes! You can take the girl outta of the city but she still has to look good!" It is a great picture and should be in the hall of fame. Chitown-Angler was started on February 10, 2003 and has received 207386755 page views in total since that date.